Home » Ancient British period. Fashion history of England. 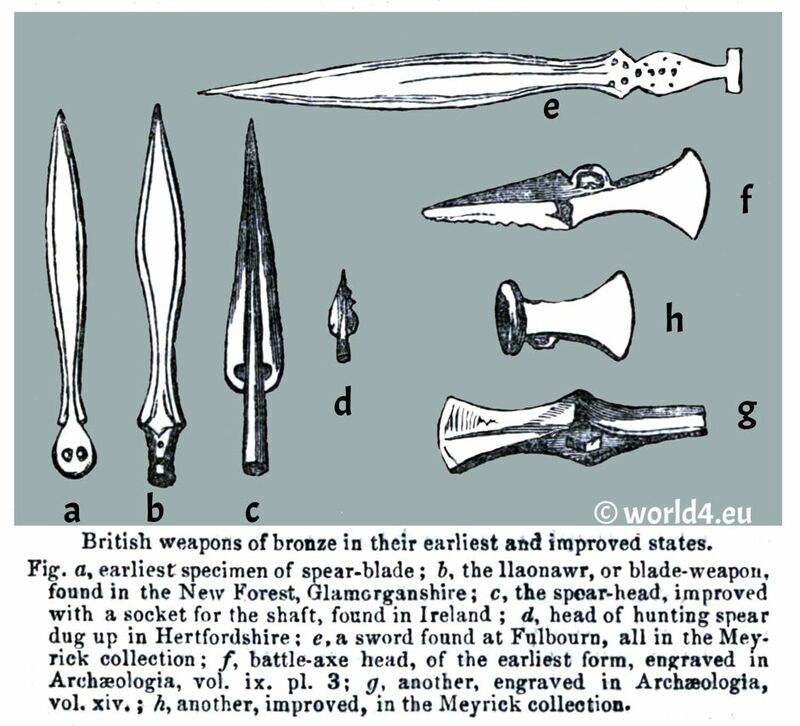 Ancient British weapons of bone and flint. Fig. 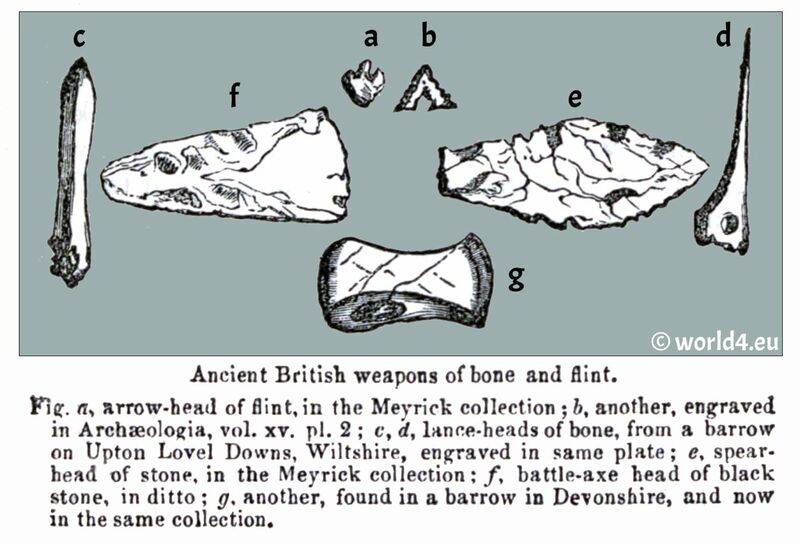 a, arrow-head of flint, in the Meyrick collection; b, another, engraved in Archaeologia, vol. xv. pi. 2; c, d, lance-heads of bone, from a barrow on Upton Lovel Downs, Wiltshire, engraved in same plate; e, spearhead of stone, in the Meyrick collection; f, battle-axe head of black stone, in ditto; g, another, found in a barrow in Devonshire, and now in the same collection. Guerrier et Guerrière Scots. 50 ans avant J. S. C. Warrior and female warrior Scots. 50 B. C..
Respecting the original colonists of Britain—the more adventurous members of the two great nomadic tribes, the Cimmerii or Cimbrians and the Celtae or Celts, who wandered from the shores of the Thracian Bosphorus to the northern coasts of Europe, and passed, some from Gaul across the channel, others through “the Hazy” or German Ocean to these islands—a few slight and scattered notices by the Greek and Latin writers, and an occasional passage in the Welsh Triads, form the meagre total of our information (1). Mere speculations, however ingenious, it would be foreign to the plan of this work to entertain; however interesting, or even convincing, to the student of antiquity, they are too shadowy to be grasped and retained by the unlearned reader. Bronze Cauldron and Urn about 500 B.C.. Vessels of this conical form with ornamental handles have been ascribed on sufficient grounds to about 500 B.C., and may be assumed to be of this date wherever they are found. The two smaller vessels are less determinate, and have angular clamps to strengthen the base, similar to, but larger than, those on the largest vessel, which is much mended by patching, rivets and not solder being used for the purpose. 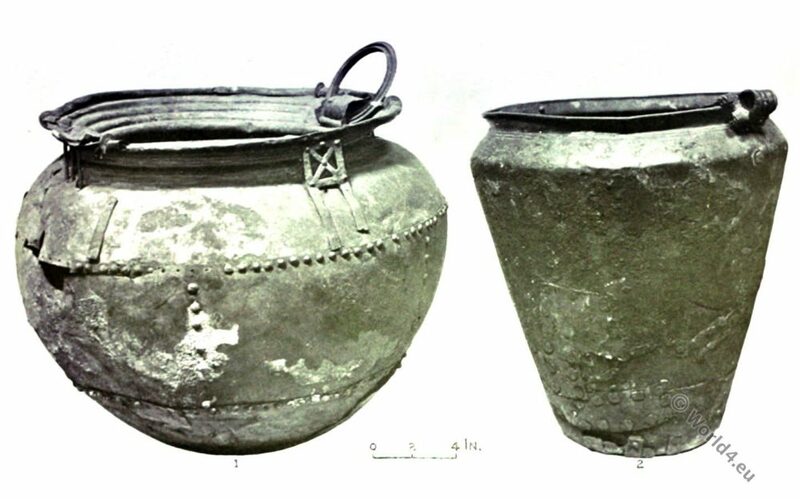 All the bronze vessels of this period seem to have been of very thin metal, and large specimens are exhibited in Case 14. They were not well adapted for cooking purposes; and some special function, perhaps of a ceremonial kind, must be assigned to those with an incurved reeded lip to which are attached a pair of ring-handles. Several have been found in Ireland and Scotland, but they are unknown outside the British Isles. From the positive evidence, however, of such weapons and ornaments as have been from time to time discovered in this country, and acknowledged as neither of Roman nor Saxon workmanship, we are, with the aid of the scanty testimony before mentioned, authorized to presume that its earliest inhabitants had relapsed into barbarism, as they receded from the civilized south, and having lost, in the course of their migrations, the art of working metals and of weaving cloth, were clothed in skins, decorated with beads and flowers, and armed with weapons of bone and flint, which, in addition to their stained and punctured bodies (the remembrance, it would appear from Herodotus, of a Thracian custom (2), must have given them, as nearly as possible, the appearance of the Islanders of the South Pacific, as described by Captain Cook. And with similar policy to that practized by our famous navigator, did the Tyrian traders apparently teach the British savages to manufacture swords, spear-blades, and arrow-heads, from a composition of brass (or rather of copper) and tin, by first presenting them with models of their own rude weapons in this mixed metal, and then gradually inducing them to adopt the improvements, and emulate the skill of their friendly visitors. The lance, for instance, formed of a long bone, ground to a point (vide figures a and d at head of chapter), and inserted into a split at the end of an oaken shaft, where it was secured by wooden pegs, was first succeeded by a metal blade, similarly shaped and fastened (vide fig. a in the following engraving); but shortly afterwards, the shaft, instead of receiving the blade, was fitted into a socket in a workmanlike manner, and finally the blade itself assumed a classical form. The arrow and the hatchet, or battle-axe, underwent the same gradual transformation and improvement, as may be seen by a comparison of the brazen weapons here engraved with those of bone and flint at the head of the chapter. The greater part of the originals are preserved in the armory at Goodrich Court, Herefordshire. British weapons of bronze in their earliest and improved states. Fig. a, earliest specimen of spear-blade; 6, the llaonawr, or blade-weapon, found in the New Forest, Glamorganshire; c, the spear-head, improved with a socket for the shaft, found in Ireland; d, head of hunting spear dug up in Hertfordshire; e,a sword found at Fulbourn, all in the Meyrick collection; f, battle-axe head, of the earliest form, engraved in Archaeologia, vol. ix. pi. 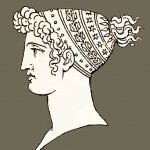 3; g, another, engraved in Archaologia, vol. xiv. ; h, another, improved, in the Meyrick collection. Sword and Rapier, British Isles. Bronze swords found in the British Isles have handles cast in one piece with the blade, and belong either to the latest Bronze age or to the earlier half of the Hallstatt period (As Hallstatt period is the older pre-Roman Iron Age in much of Europe called from about 800 BC to 450 BC…). 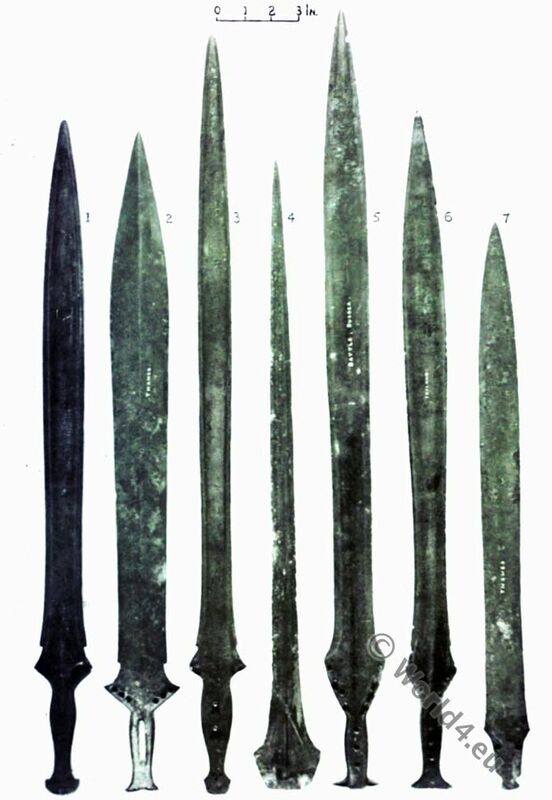 Such is the latest continental classification; but it must be remembered that the Hallstatt period is barely represented in this country, and there is nothing to show that these swords did not continue in use here till the Late Keltic times, which roughly correspond to the La Tène period of the Continent (Also Latène period. It ranges from about 450 B.C. to the time of Christ. Name giver finding place was La Tène on Lake Neuchâtel in Switzerland.). Some idea of the complete sword can be gained from the cast exhibited here of a specimen found in Yorkshire. The original has evidently been moulded after a leaf shaped sword like some in this Case, which had horn or bone plates attached by rivets to either side of the handle, and a heavy pommel of some kind, probably globular. Two swords have indeed been found in Northumberland with remains of leaden pommels of this shape, and some of those exhibited would be very un-balanced weapons without such a counterpoise. In many instances there are two notches near the base of the blade, for which no adequate reason has yet been given. The wooden scabbards then in use might be affected by the weather, so that the blade could not be pushed right home. Any risk of injury in that case would be avoided if the cutting edges stopped short of the grip. This is another characteristic of the Hallstatt sword, and justifies the attribution of most if not all our specimens to the centuries between 800 and 400 B.C. In the centre is a remarkably tine rapier-blade with its two rivets in position, found near Badbury Rings, a stronghold of the period in Dorset. This is much earlier than the swords, and should be compared with others from the Thames in Case A. To the right is an example of a type common in Scandinavia, which has lost half its handle, but retains a metal grip secured by rivets to the base of the blade and by a tang that passed halfway up the hollow handle. Part of Hoard, Dowris, King’s Co (900-600 BC. Irish End of Bronze Age). Socketed knives, spearheads, horns or trumpet. Part of Hoard, Dowris, King’s Co (900-600 BC. Irish End of Bronze Age). Socketed knives, spearheads, horns or trumpet. The trumpet was probably connected with warfare, and is especially common in Ireland, where two distinct kinds are found—those cast in one piece, and those formed of sheet-metal turned over and riveted to form the tube. In some the mouthpiece is at the end, in others at the side, like those made of elephant tusks in Central Africa. The Kelts of the second century B.C. are known to have used a large number of trumpets in war. In England trumpets have been found in the Witham at Tattershall, and at Battle, Sussex, the former having the edges united by soldering (a process unknown in the Bronze period), and closely resembling one found in Hanover. 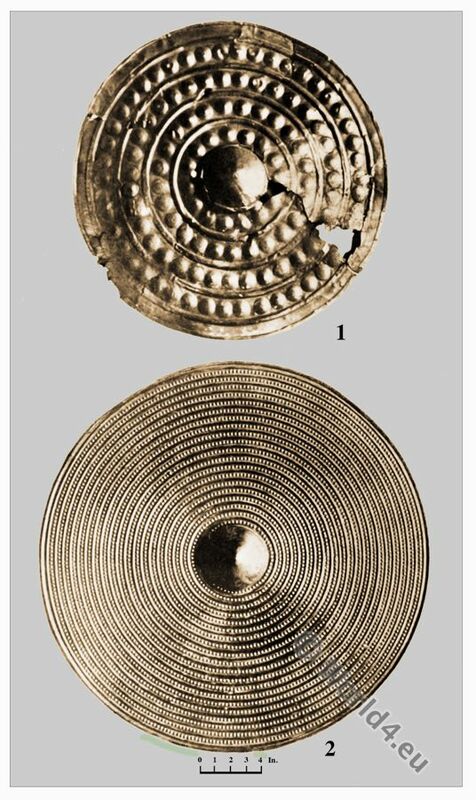 After the Dowris Hoard, the late Bronze Age is called “Dowris-phase”. The Ebbsfleet I Hoard after R. Jessup. Hoard of Bronze, Minster, Thanet. The Ebbsfleet I Hoard after R. Jessup. 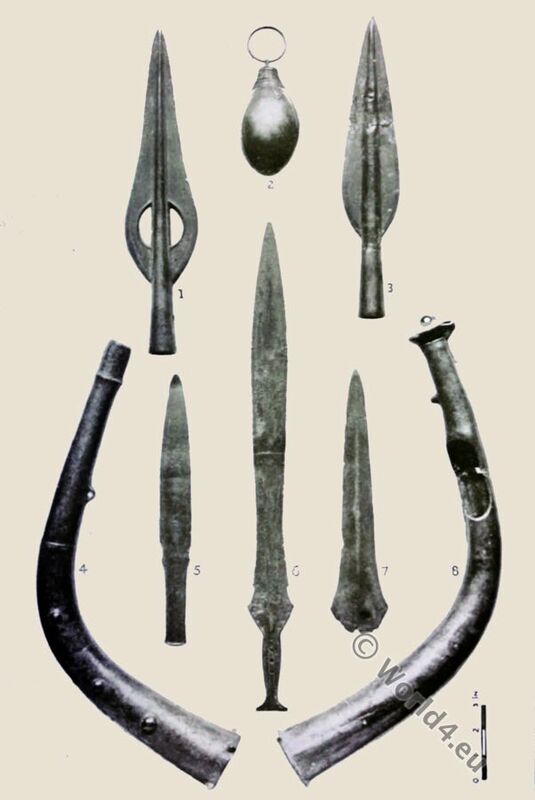 Socketed axes, spear-heads, parts of swords and axes, belt fasteners or ‘bugle’ fittings, portions of a dagger, a knife, and a quantity of ingots. Found on a farm at Ebbsfleet near Minster sometime before 1895. Femme de Breton, dans le voisinage des Pictes. 50 ans avant J. S. C.
Breton woman in the vicinity of the Picts. 50 B. C.. 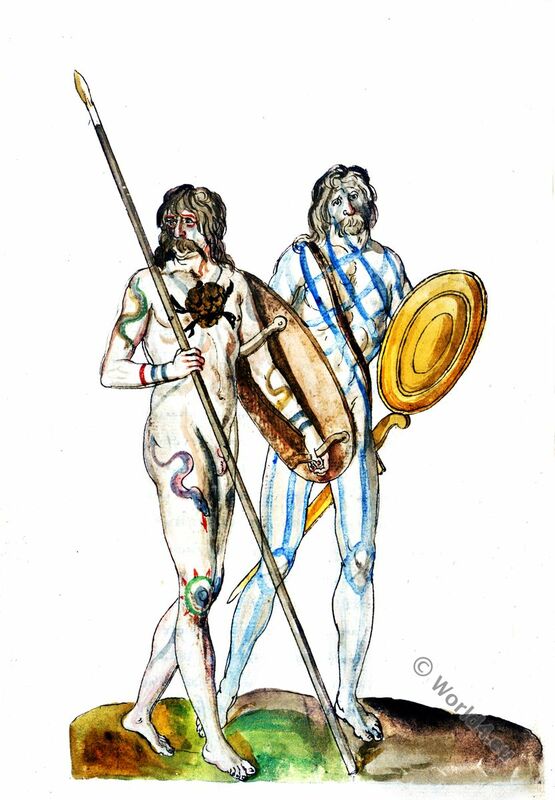 The flat circular shields too of the Britons, which were of wicker (like their quivers, their boats, and their idols (4), were soon either imitated in the same metal or covered with a thin plate of it, and then, from their sonorous quality, they were called tarians or clashers (5). The metal coatings of two of these shields are preserved in a perfect state in the Meyrick collection. They are ornamented with concentric circles, between which are raised as many little knobs as the space will admit. They are rather more than two feet in diameter, with a hollow boss in the centre to admit the hand, as they were held at arm’s length in action. “On comparing it with the Highland target,” Sir Samuel Meyrick remarks, “we shall find that, although the Roman mode of putting it on the arm has been adopted by those mountaineers, the boss, rendered useless, is still retained, and the little knobs imitated with brass nails (6)”. Several brazen swords and spear-blades, found in the bed of the Thames near Kingston, have been engraved for a frontispiece to Mr. Jesse’s interesting work, entitled “Gleanings of Natural History”; but they are there erroneously called Roman. Whoever will take the trouble to compare them with the numberless acknowledged British weapons in various English collections, and with many similar relics found in Ireland, where the Romans never set foot, will scarcely need the additional argument, that the Romans, at the period of the invasion of Britain, used weapons of steel only, to convince themselves of the Celtic origin of those curious military antiquities. Bronze Bucklers, Thames and Wales. Both are from peat-bogs, one near Aberystwyth, Cardiganshire, and the other at Moel Siabod, near Capel Curig, Carnarvonshire. The smaller example, ornamented with large bosses, is from Athenry Co. Galway, and may have formed the centre of a larger shield of leather or wood. Bucklers of embossed bronze have been found in England and Wales, Scotland and Ireland, not always singly, but never with other objects that afforded definite information as to their date. Three distinct sizes are observable in examples from the British Isles, with diameters of nearly 24 in., of 12 to 18 in., and about 9 in. respectively, and all are provided with a central boss to protect the hand. Fifty-five years before the birth of Christ, Julius Caesar landed on the shores of England, and found the inhabitants of Cantium (Kent) the most civilized of all the Britons, and differing but little in their manners from the Gauls (7), from whom they had most probably acquired the arts of dressing, spinning, dyeing, and weaving wool, as they there practised them after the Gaulish fashion, and possessed, in common with their continental kindred, some valuable secrets in them, unknown to other nations. Of this fact we have the direct evidence of Diodorus Siculus, Strabo, and Pliny; the latter of whom enumerates several herbs used for this purpose, and tells us that they dyed purple, scarlet, and several other colours, from these alone (8). But the herb which the Britons chiefly used was the glastum or woad (called in their native language, y glas, glas lys, and glacilys, from glas, blue 9), with which they stained and punctured their bodies, in order, says Caesar, to make themselves look dreadful in battle (10). His words are, however, “Omnes vero se Britanni vitro inficiunt, quod coeruleum efficit colorem, atque hoc horribiliori sunt in pugna adspectu.” Now the word vitro is disputed, and “nitre,” “luteo,” “ultro,” “glauco,” and “guasto,” have been alternately suggested as the correct reading. Pliny says they used “glastum” (i. e. woad), but Ovid uses the singular expression “Viridesque Britannos.” Amorum. Eleg. 16. And glas, in Celtic, signifies green as well as blue. It is applied to the sea, and to express, poetically, the sea,as glasmhaigh, a green plain. Crann ghlas is a green tree. It enters into combination also with a variety of words in the Celtic expressive of grass, greens for food, salad, sea wrack, and also means pale, wan, poor, and even in colour greyish. Each glas is a grey horse. The dress of the fairies is always spoken of as glas, Anglice, green and shining: and no doubt it is the origin of our word glass, which has been applied to the composition so called in consequence of its presenting indifferently the hues and lustrous appearance alluded to. A man could not dye his body with glass, but the obvious derivation of that word from the Celtic renders the vitro of Caesar a still more curious expression. The word “coeruleum” may also be translated green, wan, or pale, like the Celtic glas, and the skin washed lightly over with blue or grey would present a greenish and ghastly appearance. And here it may be remarked, that from the fact of the Romans, on their first invasion of the island, beholding the inhabitants only when, according to a common Celtic custom (a custom partially followed by the Scotch Highlanders to the days of the battle of Killicrankie), they had flung off their garments to rush into action, arose the vulgar error that the Britons lived continually “in puris naturalibus;” whereas, we have the testimony of Caesar himself to the fact, that even the least civilized, “those within the country,” went clad in skins; whilst the southern or Belgic Britons were like the Gauls, and therefore not only completely but splendidly attired, as may be proved from various unquestionable authorities (11). 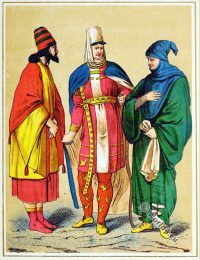 Of the several kinds of cloth manufactured in Gaul, one, according to Pliny (12) and Diodorus Siculus (13) was composed of fine wool, dyed of several different colours, which being spun into yarn, was woven either in stripes or in chequers, and of this the Gauls and Britons made their lighter or summer garments. Here we have the undoubted origin of the Scotch plaid or tartan, which is called “the garb of old Gaul” to this day; and indeed, with the exception of the plumed bonnet and the tasselled sporan or purse, a Highland chief in his full costume, with tunic, plaid, dirk, and target, affords as good an illustration of the appearance of an ancient Briton of distinction as can well be imagined. 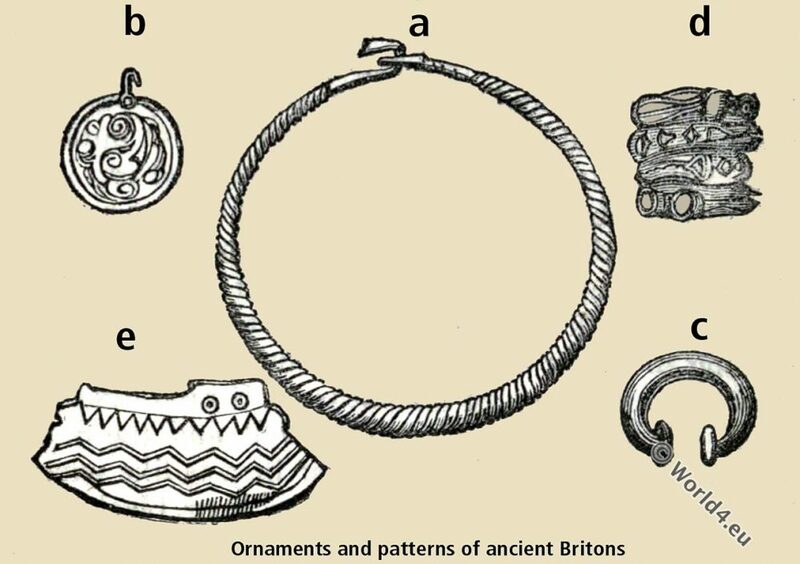 The ornaments of the Britons, like those of the Gauls, consisted of rings, bracelets, armlets, a collar or necklace of twisted wires of gold or silver, called torch or dorch in British, and peculiarly a symbol of rank and command. 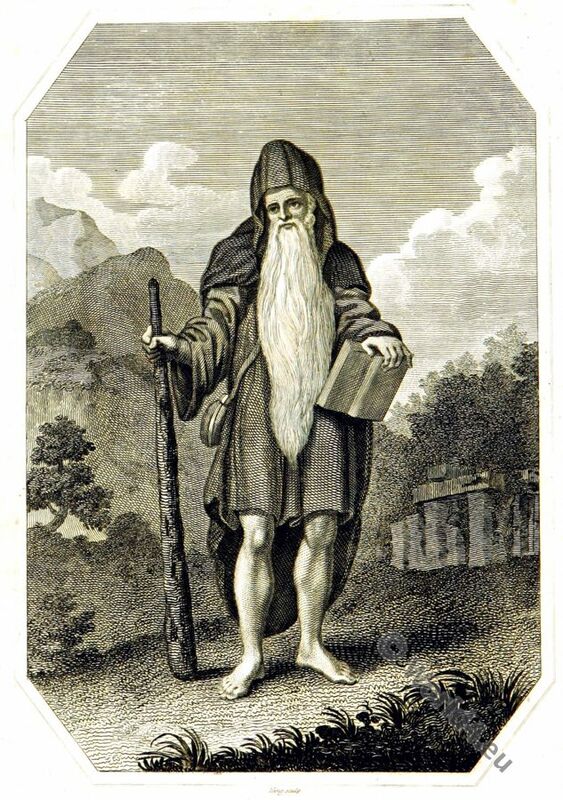 The ancient Lord of Yale was called Llewellyn am Dorchog, or Llewellyn with the Torques. The one here represented is of brass, and was found on the Quantoc Hills. 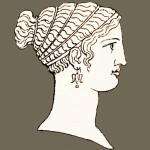 So fond, indeed, were the Britons of ornaments of this kind, that those who could not procure them of the precious metals wore torques of iron, “of which they were not a little vain (20).” The ring, according to Pliny, was worn on the middle finger (21). 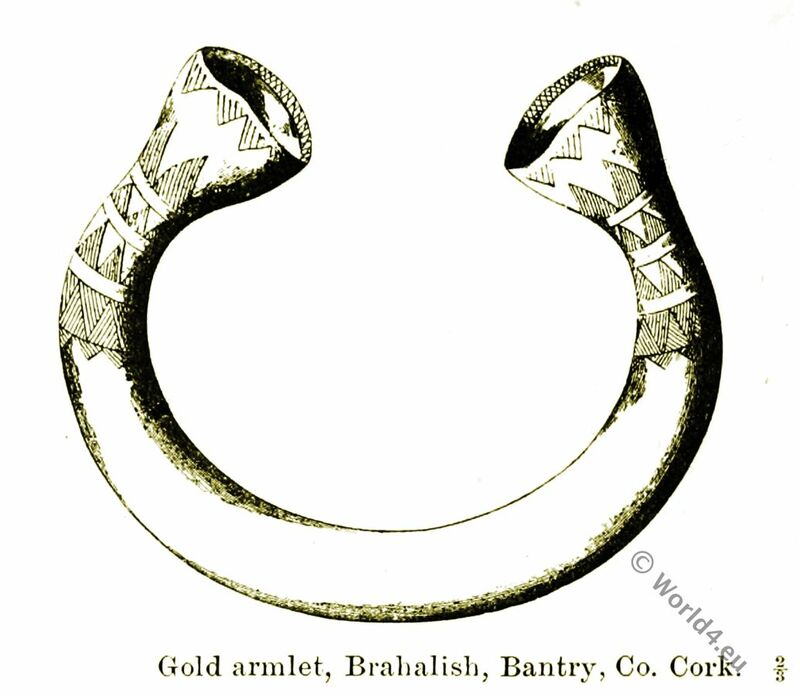 Gold armlet, Brahalisli, Baiitry, Co. Cork. Ornaments and patterns of the ancient Britons. Fig. 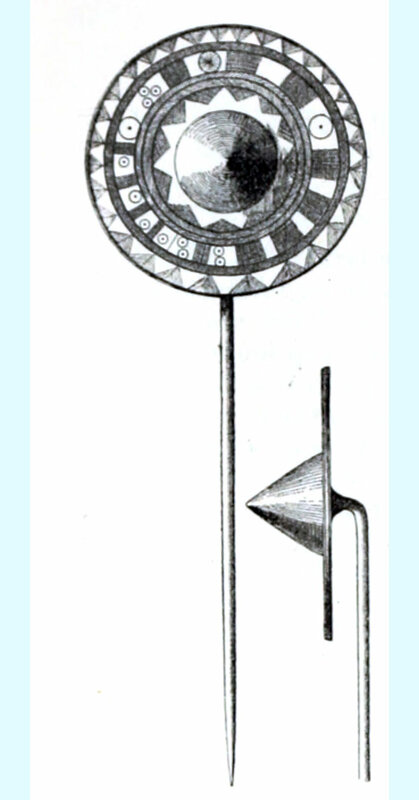 a, a torque of brass found on the Quantoc Hills, and engraved in the Archaeologia, vol. xiv. 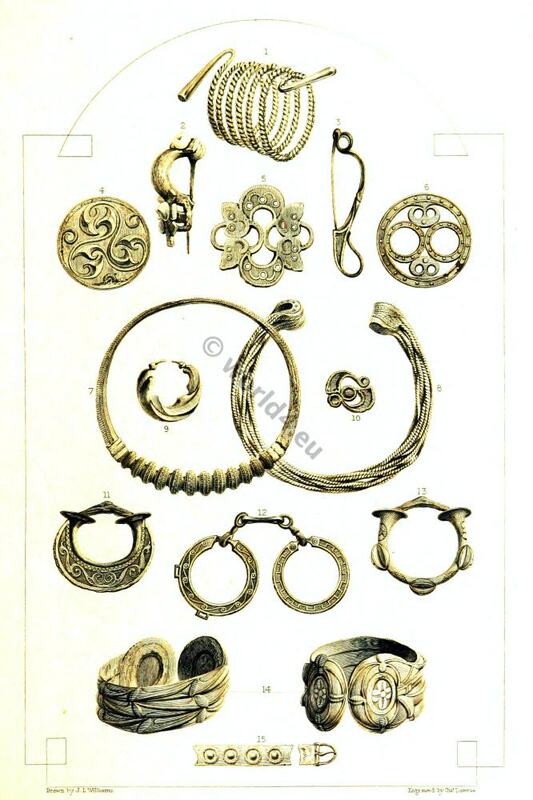 ; h, an ornament of brass; c, a bracelet; d, an annular ornament of bronze for fastening the mantle, Archaeologia, vol. xxii. pi. 25, but therein called a bracelet; e, a piece of British earthenware, Archaeologia, vol. xxi. Appendix. The dress of the British females may be ascertained from Dion Cassins’s account of the appearance of Boadicea, Queen of the Iceni. Her light hair fell down her shoulders. She wore a torque of gold, a tunic of several colours, all in folds, and over it, fastened by a fibula or brooch, a robe of coarse stuff (22). Pin with ornamented head, Irland. The pins here shown are all of the last period of the Bronze age, and are all represented in Danish finds. 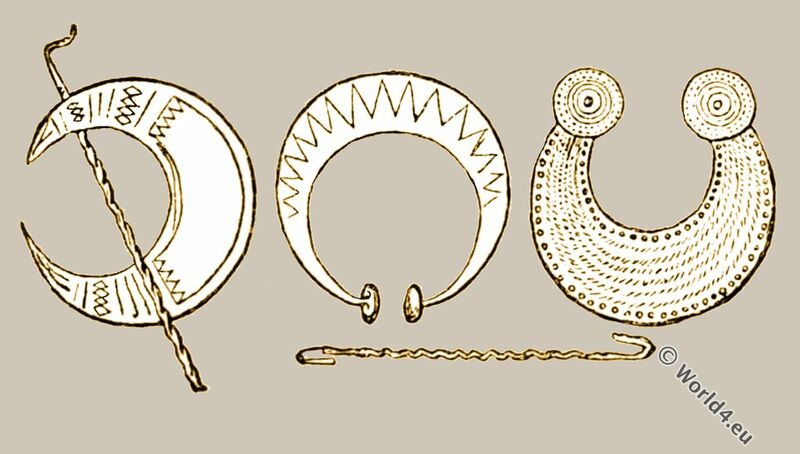 The cup-shaped head may be compared with the terminals of gold bracelets from Ireland, and the large pin engraved with characteristic ornament is an exaggerated example of a common type, with the circular head bunt over. The Commonality and the less civilized tribes that inhabited the interior, as we have already stated on the authority of Caesar, went simply clad in skins (23). 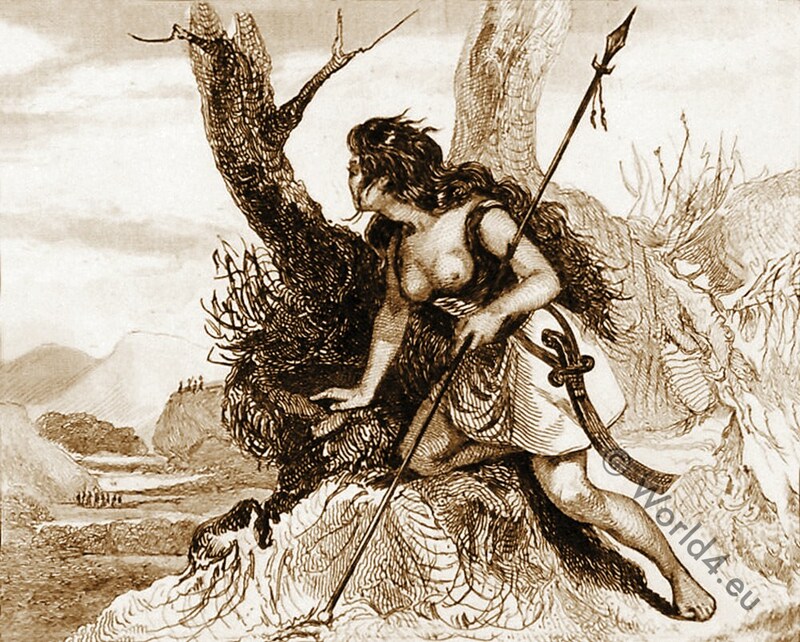 The hide of the brindled or spotted ox was generally preferred, but some wore the ysgyn, which was the name for the skin of any wild beast, but more particularly the bear; while others assumed the sheepskin cloak, according as they were herdsmen, hunters, or shepherds (24). That, in the absence of more valuable fastenings, the cloak was secured, as amongst the ancient Germans, by a thorn, we have tolerable evidence in the fact of this primitive brooch being still used in Wales. There remains another class to be considered. It was divided into three orders. The Druids, the Bards, and the Ovates. The dress of the druidical or sacerdotal order was white, the emblem of holiness and peculiarly of truth. The Welsh bard Taliesin calls it “the proud white garment which separated the elders from the youth (25). The bards wore a one-coloured robe of sky-blue, being emblematical of peace; thus another bard (26), in his Ode on the death of Cadwallon, calls them “wearers of long blue robes.” The ovate or Ovydd, professing astronomy, medicine, &c. wore green, the symbol of learning, &s being the colour of the clothing of natnre. Taliesin makes an ovate say, “with my robe of bright green, possessing a place in the assembly (27).” The disciples of the orders wore variegated dresses of the three colours, blue, green, and white (28). The arch-druid or high-priest wore an oaken garland, surmounted sometimes by a tiara of gold. 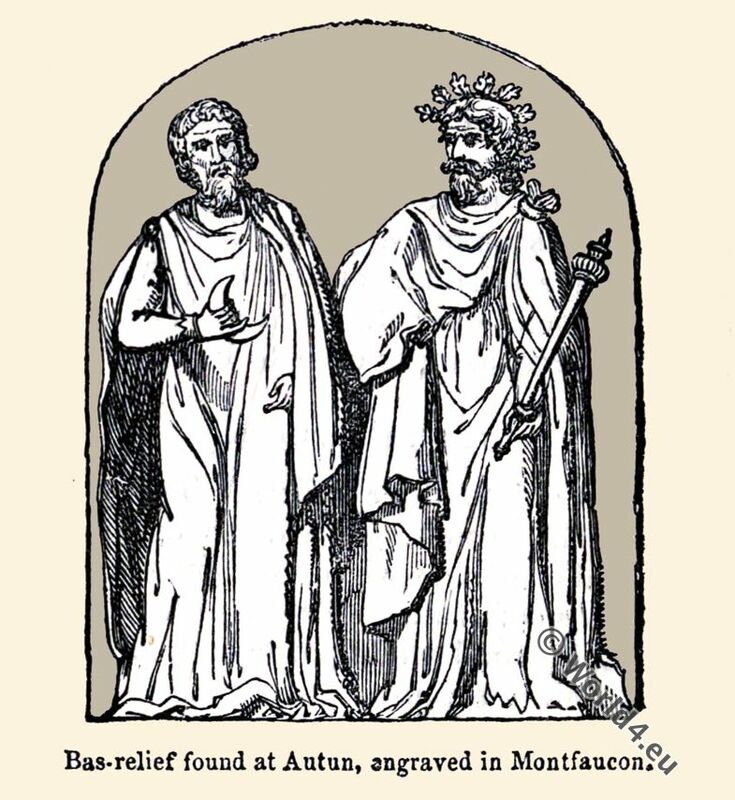 A bas-relief, found at Autun, represents two Druids in long tunics and mantles; one crowned with an oaken garland, and bearing a sceptre; the other with a crescent in his hand, one of the sacred symbols. They are both engraved below, with a crescent of gold, a druidical hook for tearing down the mistletoe, and three other articles, supposed druidical, all of gold, and found in various parts of Ireland (29). Celtic Druids. Bas-relief found at Autun, engraved in Montfaucon. The mantle of one of the Druids, it will be observed, is fastened on the shoulders by a portion of it being drawn through a ring, and instances of this fashion are met with frequently in Anglo-Saxon illuminations. We believe it has never occurred to any previous writer on this subject, that the annular ornaments resembling bracelets (vide fig. d), so constantly discovered both here and on the Continent, and presumed to be merely votive, from the circumstance of their being too small to wear on the arm or the wrist, may have been used in this manner as a sort of brooch by the Gaulish and Teutonic tribes. (1) Herodotus, book iv. ; Plutarch in Mario; Welsh Triads. 4 and 5. (2) Herodotus, v. 6. 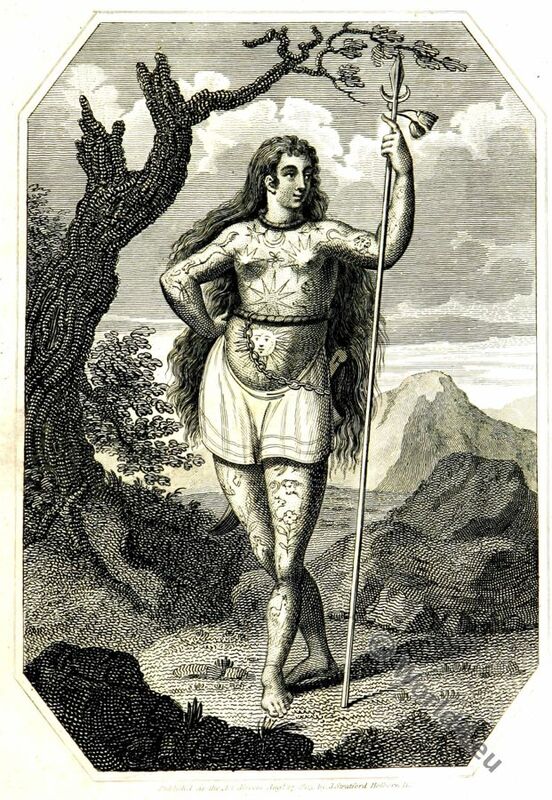 “To have punctures on their skin is with t.iem a mark of nobility, to be without theme is a testimony of mean descent.” Isidorus describes the British method of tatooing in these words: “They squeeze the juice of certain herbs into figures made on their bodies with the points of needles.” Orig, lib. xix. c. 23. It seems to have been done in infancy, as Pliny tells us the British wives and nurses did it. Nat. Hist lib. xxii. c..2. 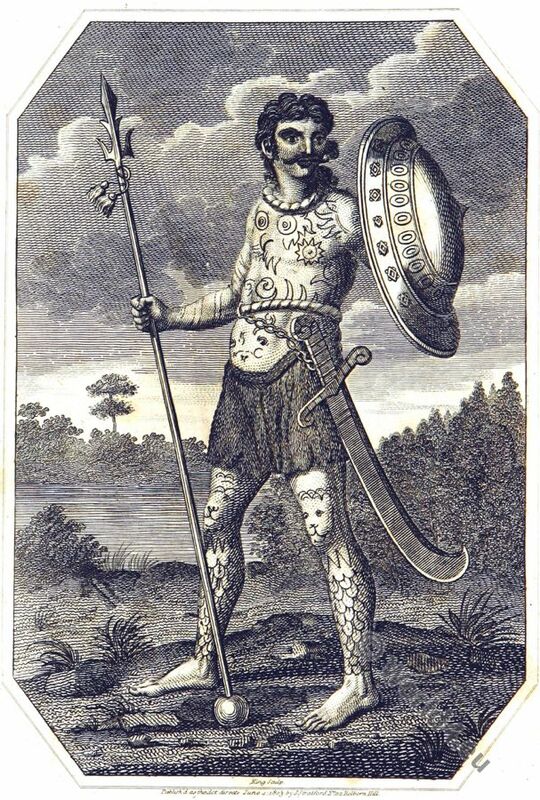 (3) Meyrick, Engraved Illustrations of Ancient Arms and Armour, vol. i., text to plate 47. (4) The ingenuity of the Britons in this species of manufacture was much admired by the Romans, who, when they introduced into Italy the British bascawd (basket-work), adopted also its name, terming it bascauda. The British name for a quiver is cawell saethan, i. e. a basket-work case for arrows. The ancient British wicker boat, called curwgll or coracle, formed of osier twigs, covered with hide, is still in use upon the Wye and other rivers both of Wales and Ireland. (5) Archaeologia, vol, xxiii. p. 94; Herodian and Xiphilin. (6) Archaeologia, vol. xxiii. p. 95. (8) Hist. Nat. lib. xvi.c. 18; lib.xxii. c. 26. (9) S. R. Meyrick, Costume of the Original Inhabitants of the British Isles, folio, London, 1821. (10) De Bell. Gal. lib. v. Herodian says the Britons who resisted Severus painted the figures of all kinds of animals on their bodies, lib. iii. p 83; and Martial has the words “Coeruleis Britannis,” lib. ix. c. 32. (11) Livy’says, that at the battle of Cannae there were Gauls who fought naked from the waist upwards (xxii. 46); and Polybius tells us, that some Belgic Gauls fought entirely naked, but it was only on the day of battle that they thus stripped themselves. Lib. ii. c.
(12) Hist. Nat. lib. vili. c. 48. (13) Lib. v. c. 30. (14) Ibid. Martial has the line, “Like the old bracchae of a needy Briton.” Epig. xi. (17) Ibid. lib. V. ; and Caesar De Bell. Gal. lib. v.
(18) Samuel Rush Meyrick, Costume of the Orig. Inhab. ut supra. (21) Hist. Nat. lib. xxxiii. c. 6. (22) Xiphilin. Abridg. of Dion Cassius. (23) De Bell. Gal. lib. v. c. 10. (24) Samuel Rush Meyrick, Orig. Inhab. (25) Owen’s Elegies of Llywarch Hen. (26) Cynddelw. Owen’s Elegies of Llywarch Hen (Llywarch Hen (meaning ‘Llywarch the Old’) was a 6th-century prince and poet of the Brythonic kingdom of Rheged, a ruling family in the Hen Ogledd or “Old North” of Britain (modern southern Scotland and northern England). (27) Mic. Dimbych. Owen’s Elsgies. (28) Or blue, green, and red. A disciple, about to be admitted a graduate, is called by the bards “a dog with spots of red, blue, and green.” Meyrick, Orig. Inhab. (28) Collectanea de Rebus Hibernicis, vol. iv. ; Archaeologia, vol. h.; Meyrick’s Orig. Inhab. passim; King’s Munimenta Antiqua, &c. The centre ornament is supposed to be a tiara for the arch-druid, and that to the right a golden collar or Breast-plate. The wreathed rod of gold, with a hook at each end, is probably a small torque flatened out. 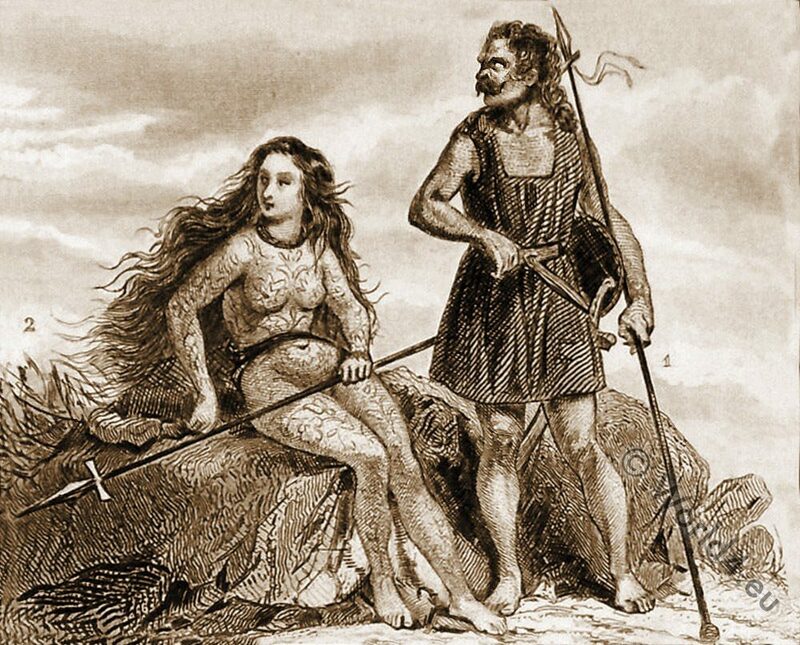 A complete history of the inhabitants of the British Islands. By James Robinson Planché, ESQ. London 1846. The History of England from the earliest dawn of authentic record to the ultimate ratification of the general peace at Amiens in 1802 and the Subsequent War in 1803, by George Courtney Lyttleton. Published by J. Stratford, London 1803. British Museum. A Guide to the Antiquities of the Bronze Age in the Department of British and Mediaeval Antiquities. 1904.